The W200P/L Low Torque Potentiometer Windvane has a lower torque than the standard W200P potentiometer windvane, allowing increased sensitivity at lower windspeeds, however the gap and "deadband" at north are larger and the potentiometer is less robust. 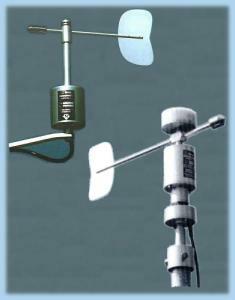 Accuracy: +/-4° in steady winds over 3m/s (3.5m/s /WR, 2m/s /LV). Potentiometer Voltage: 1V to 5V (recommended), 20V absolute maximum. Connections: 6 wire screened cable. Materials: Anodised aluminium alloys and stainless steels for exposed parts. Hard plastic (upper) bearing and precision ball-races. A marine version (/WR) is available.